Tracking Down the Best Pillowcase for Hair: Silk, Satin or Copper… Which One Is Best For You? Your pillowcase matters! The material is important. You want to keep hair healthy and attractive. The best pillowcase for hair can help. But where do you start? There are so many different materials to choose from. It can sometimes be incredibly overwhelming. In this review, we’ll be breaking down the different types in an effort to help you chose which is best for your specific hair type and needs. Before you know it, you’ll be sleeping on the best pillowcase for hair and enjoying the benefits of treating your hair right as you rest. Let’s get started! If you have the room in your budget, silk is always a great option when looking for the best pillowcase for hair. 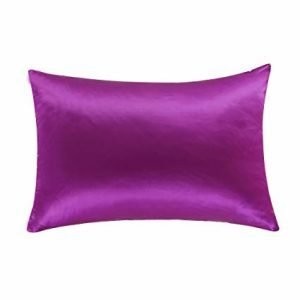 I always recommend the OOSilk Mulberry Silk Pillowcase. Again, this pillowcase is available in a wide variety of colors to meet your interior design needs. Because silk is a natural material, you can rest assured that this pillowcase is chemical free. It’s naturally dyed so there’s no color fading to worry about either. It’s hypoallergenic, smooth, soft, breathable and comfortable. Because it’s made with Mulberry silk, you know that this is one of the best silk pillowcases available. The strength of this silk means that your investment will last you quite some time. If you’ve always been intrigued by the idea of owning a silk pillowcase, this is a great brand to start with. So what’s the best satin pillowcase available on the market? My personal favorite comes to us from LJL Design. You get two pillowcases, which makes the price even more appealing. With a variety of colors, you’re sure to find one that matches your current bedding set. Even if your pillows are a bit on the older side, they’ll instantly feel brand new and comfortable once you slip them into these cases. This particular brand usually holds up fairly well in a standard washing machine as well, so you can avoid the inconvenience of dry cleaning. These pillowcases also deliver on all the benefits we’ve already discussed regarding pillowcases and hair. Your hair will retain its natural moisture while avoiding kinks and bends as you sleep. It won’t snag on your pillowcase as you sleep so you’ll wake up with your hair looking very close to what it did when you went to bed. Besides all of the hair benefits, like fewer tangles and damage, more moisture and waking up with the same hairstyle you went to bed with, there are plenty of other great benefits of a satin pillowcase. Say goodbye to sleep lines! Sleeping on a satin pillowcase will give you smoother skin. Your skin will also be softer as it retains its natural oils and moisture. Don’t forget about the hair on your face! I’m talking about your eyelashes. A satin pillowcase can also promote longer eyelash growth that will certainly get you noticed. Have you ever heard of a copper pillowcase? This material provides some pretty amazing benefits, both for skin and hair. The best brand to go with by far is the Iluminage Skin Rejuvenating Pillowcase. It’s made from 100% Cupron fabric, which is a polyester copper oxide mix that is actually made from the mineral copper. It has been clinically proven to minimize the signs of aging. Because it’s not just a case and is an actual pillow instead, you’ll definitely pay a bit more for this product. 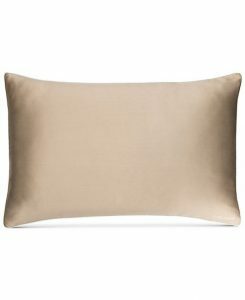 But anyone who has taken the plunge and purchased a copper pillow always provides rave reviews. I was a little nervous when I tried one out for myself but let me tell you, my hair and skin have never looked better. Although the pillow is mainly geared towards preventing wrinkles and improving the appearance of fine lines, my copper pillowcase review makes it known that it also makes your hair look stunning as well, for similar reasons as a satin or silk pillowcase for hair care would. It doesn’t snag. It doesn’t kink your hair or strip it of moisture. If you’re looking for a pillowcase that can improve your hair and skin, a copper pillowcase is always going to be your best option. It’s the best pillowcase for hair and skin on the market by far. If you want to remove your body hair so that you have silky smooth skin then also check out our review on the Iluminage laser hair removal device. If copper is out of your price range, don’t forget about the pillowcase that started it all. Silk is always an excellent choice, improving both your hair and skin as well. Remember that silk gives your hair a smooth surface to glide on, preventing snags, damage and breakage. It also stays cool, so you won’t sweat. Your hair remains clean and free of frizz. Silk is also durable and long-lasting. It’s a natural material and I think we can all agree that Mother Nature knows what she’s doing when it comes to providing us with materials that really can make a difference with our skin and hair. If you’ve always picked your pillowcase based on color or pattern, you might not have realized that there are such luxurious materials to choose from. Both silk and satin are incredibly luxurious pillowcase materials that can make you feel like you’re sleeping on a cloud. Even better, both of these materials can help with your hair. It might sound crazy at first but if the type of clothing that you wear has an effect on your skin (softer materials feel light and relaxing while thicker materials feel rough and uncomfortable at times) then certainly a pillowcase will do the same for your hair. Silk is a natural fiber. Satin is a weave, which can be created by using silk or manmade materials. Silk will always be stronger, which is just one of the reasons that it is also more expensive. Both are a huge improvement for your hair if you’ve been sleeping on cotton or polyester. Let’s really go into detail about these two materials. Let’s start by discussing a silk pillowcase for hair. You’re sure to know someone who encourages silk in the bedroom, as it has a long list of health benefits. While it improves your hair, it also helps with your skin, allergies and overall comfort as well. Here are some of the top benefits of silk when it comes to your hair. Prevents thinning of hair. Cotton can actually tug at your hair, causing unwanted damage and even breakage. Silk won’t pull on your hair. Silk prevents knotted hair. Instead of waking up in the morning with hair that looks like a birds’s nest, it will still be smooth from the night before. Less brushing is always better for your hair. Silk stimulates hydration. Always a plus! Silk can prevent greasy hair by reducing the amount of sebum that your scalp produces overnight. So what about satin? Keep in mind that satin is often made with silk so the benefits are similar but not identical. Here’s what a satin pillowcase for hair brings to the table. Allows you to wash your hair less. It won’t kink or add curves or bends to your hair. This allows you to somewhat style your hair before bed and wake up with it looking pretty much the same the next morning. Stops hair breakage, since your hair is able to glide more smoothly across its surface as you toss and turn in dreamland. Keeps your hair’s natural oils in place. A cotton pillowcase absorbs everything. This means any moisture in your hair, whether it’s water or oil. Satin won’t do this so your hair will be more naturally protected by its own oils. Are Silk and Satin the Same Thing? While the benefits are similar and even the appearance of the two materials seem to be the same, silk and satin are different materials. The basic difference is that silk is natural, while satin is manmade. Silk is made from the cocoons of silk worms. The material is taken from the cocoons and then processed into threads. These threads are directly used to make clothing and other products, like pillowcases. Satin can be made from a variety of products, including silk. Nylon and polyester are also common. The materials are then weaved together so while the look and appearance are similar to silk, it doesn’t have the same strength. Speaking of appearances, the two are similar but not identical. If there’s no label telling you what a pillowcase is made from, keep in mind that silk will have a shimmering appearance. Satin will appear identical but if you look closely you will notice that it is more glossy. If you look even closer, you’ll see that the background is actually dull. A few other things to keep in mind – Whilst silk is more expensive, the added expense could be worth it. Silk holds its shape longer. Satin can shrink or stretch if placed in hot water. For this reason, it is recommended that satin should only be dry cleaned. This added cost should be taken into consideration. Curly hair that comes naturally for some girls is a blessing and a curse at the same time. The styles and looks that they can achieve are truly stunning but there’s no doubt that curly hair requires a lot more work. Many girls just don’t realize how important their pillowcase is. Think of it this way. There is nothing that comes into more contact with your hair than your pillowcase. Your hair rests on it for hours at a time, every single night. A cotton pillowcase is not the best pillowcase for hair, no matter what hair type you have. It should be especially avoided if you have curly hair. Curls need plenty of moisture and frizz is a curl’s worst enemy. On the other hand, a satin pillowcase for curly hair will help your hair retain its moisture and reduce frizz. You may even get a better night’s sleep, as many people find satin to be more comfortable than cotton to fall asleep on. If you’re on a budget, satin is also a great choice because it will give you similar benefits as a silk pillowcase but at a lower price. If you find yourself struggling with your curly hair in the morning, invest in a satin pillowcase for hair before doing anything else. It could be the only change you need to make to transform your morning hair. For similar reasons, a pure silk pillowcase is also a great addition to any curly haired girl’s bed. Prevent kinks and bends while keeping your hair moisturized and free of frizz. If you really want to make a difference with your silk pillowcase for hair, a long strand mulberry silk pillowcase with a traditional charmeuse weave is best. It’s expensive but well worth it. In fact, this type of pillowcase may well be the best silk pillowcase overall, so definitely give this one a try if you have the budget. You definitely get what you pay for. Here’s another great benefit of silk pillowcases. They’ll help to regulate your temperature. In other words, even if your bedroom is on the warmer side, the temperature of your pillowcase won’t climb. This prevents sweating, which will keep your curly hair smooth, clean and prevent flyaways. If you’ve always slept on a cotton pillowcase, you’ve been doing yourself a disservice for years. I’m willing to bet that some mornings you wake up with oily hair and pretty much every morning you wake up with tangles and kinks. It’s time to finally branch out and try something new. 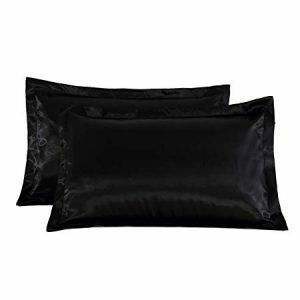 A silk or satin pillowcase is the perfect change for your hair and beauty needs. If budget is an issue, look at satin pillowcases for hair. You can always work up to a silk or copper in the future. If budget isn’t an issue at all, look at a copper pillowcase, even though silk will provide you with incredible benefits as well. The material isn’t as important as the results. As long as you are protecting your hair by leaving it moisturized and preventing tangles and kinks that can lead to breakage, you’ve made a smart move towards better hair. Is it possible to sleep your way to better hair? You bet! Change your pillowcase tonight and you’ll change your hairstyle tomorrow.